Ricotta is a go-to fresh cheese. It’s light and fluffy, creamy and slightly sweet, and it’s so go-with-the-flow that it can go in any savory or sweet direction you point it in. And it’s resourceful! Italians first crafted ricotta to make use of their romano’s leftover whey. They cooked the whey until the curds rose, then skimmed and drained them, and voila: ricotta! We make our ricotta with fresh cow’s milk and whey, and the end result is a pure and simple, satisfying fresh cheese that’s always easy peasy, light and breezy. 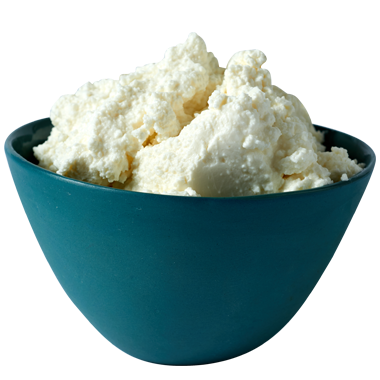 Ricotta is an excellent cooking cheese because it adds body and a fresh creaminess to whatever you cook with it. It doesn’t keep for very long, though, so always try to use it within a week of purchase. Anything light, and preferably bubbly or effervescent, drinks well with ricotta. Some of our favorite pairings include white or pink vinho verde, off-dry prosecco, cava, pinot grigio, pilsner, kolsch and citrusy fruit beers. Ricotta is a really fun cheese to cook with and serve because it’s happy to go sweet or savory. It’s perfect for stuffing big shells and tubes of pasta, especially when they’re smothered in a bright tomato sauce. We’ll often add fresh herbs, parmesan and cooked spinach to the mix. It’s also great to bake into sweets like cheesecakes, lemon-ricotta pancakes or berry tarts. On a board, ricotta goes well with sundried tomatoes, figs, fresh spring asparagus and blueberries. It’s also great with sturdy salads featuring peppery greens like radicchio, arugula and dandelion.